Citation Information: J Clin Invest. 2009;119(11):3226-3235. https://doi.org/10.1172/JCI38374. Schematic outline of adoptive immuno­therapy with lymphocytes extracted from liver allograft perfusate. 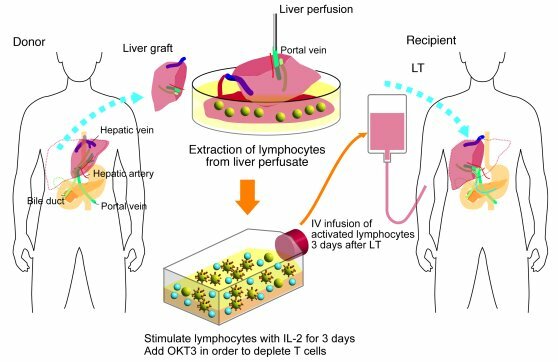 The therapy involved giving an intravenous injection of IL-2/OKT3–treated liver lymphocytes to LT recipients. The lymphocytes were extracted from the donor liver graft perfusate. After 3 days of culture with IL-2 (100 JRU/ml), the activated liver NK cell–enriched lymphocytes were administered to the LT recipients through venous circulation. OKT3 (1 μg/ml) was added to the culture medium 1 day before this administration in order to prevent GVHD.